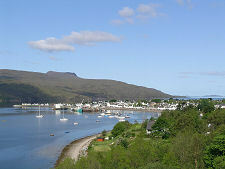 With the exception of Lochinver itself, the areas to the west of the main A835 as it heads north from Ullapool are little known and little visited. This is a shame, because it is a fascinating area that amply repays exploration. Be aware, however, that except for the A835, all the roads used on this tour are single track, and some are particularly narrow and twisting. The main route shown in dark blue on the map is 93 miles long, starting and finishing in Ullapool, and should be tackled clockwise. This makes the most of the views, and tends to keep the sun behind you as far as possible. It also means you reserve the best and easiest roads for the end of the day, when you are likely to want to relax a little. Four small excursions from the main route are suggested, all also using almost exclusively single track roads. The trip out to Reiff adds 1.5 miles each way. The 1.5 mile each way excursion to Achmelvich is one you should try to do if you can, however, to experience the wonderful beach there. The 4 mile each way detour to the Stoer Head Lighthouse at the end of the Stoer Peninsula is well worth doing if you have the time; as is the 2 mile (along good roads with white lines) each way to Kylesku and one of the most beautiful bridges in the world. The main A835 climbs north west out of Ullapool before turning north east when it reaches the coast at Ardmair. From here you carry on along Strath Canaird to the unclassified road well signposted to Achiltibuie. You follow this minor road through superb scenery along the north side of Loch Lurgainn and beneath the slopes of the remarkably spiky little mountain Stac Pollaidh. As you get to the end of the loch on your left, a minor road on the right is signposted to Lochinver. Remember where it is, because you'll be taking it a little later on in the tour. 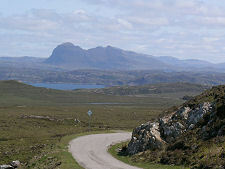 For the meantime follow the road ahead as far as a junction at which you take a left turn to Achiltibuie. This leads to the coast at Badentarbat Bay, where you keep left again. Achiltibuie itself is strung out above the coast and most visitors will make their way either to the bar of the Summer Isles Hotel, which offers great food, before retracing their steps out of the village. This time keep to the left at the junction overlooking Badentarbat Bay, following a road that takes you to Altandhu. Beyond this you can take a side road for the 1.5 miles to Reiff, which is as far as the public road progresses along the peninsula. Or you can follow the road round and across the peninsula to Achnahaird. A side turning here leads you to the access to the beach. Otherwise press on, keep left at a junction you will recognise from your outward trip, then retrace your steps as far as the side road to Lochinver. This glorious road offers some stunning views of the inland mountains, and shows Suilven from a particularly unusual angle. The twists and turns keep you mostly away from the coast and except during the holiday period you might find you meet no-one until you cross the River Kirkaig as you approach Inverkirkaig. 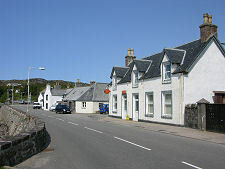 A little beyond is Lochinver, by far the largest settlement on the trip except for Ullapool. The Assynt Visitor Centre on the main street through the village is well worth a look if you have the time. North of Lochinver you travel on the main A837 for a few hundred yards before turning left onto a road that has a number, the B869, but which is every bit as single track as those you've traversed so far. Watch out, a few miles north of Lochinver, for the turning on the left to Achmelvich: home to one of the whitest beaches you will find anywhere. 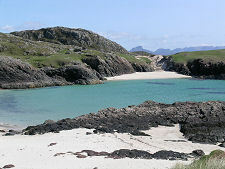 After traversing some very rough country, the B868 emerges in Clachtoll, whose beaches are also well worth exploring. Clachtoll Broch, located on a very rocky stretch of foreshore north of the village, is also interesting. A little further on is Stoer, and beyond it the road cuts across the tip of the Stoer Peninsula to Clashnessie Bay. A 4 mile each way excursion takes you to the tip of the peninsula and the Stoer Head Lighthouse. West of Stoer, the road passes through Drumbeg and its rather smaller neighbour Nedd before winding its way back to the A894 a couple of miles south of Kylesku. The 2 mile each way excursion north to see this village, the old ferry slipways, and the beautiful bridge that made them redundant, is highly recommended. You'll be pleased to know the rest of your tour is on good quality roads. The main road back towards Ullapool climbs over the flank of Quinag before descending to meet the A837 on the shore of Loch Assynt. At the head of the loch it is worth pausing to visit Ardvreck Castle. You then pass Inchnadamph and, after a surprise right turn that is easy to overshoot, go through Elphin. You'll find that completing the journey back to Ullapool takes considerably less time than the journey out! Distances: The main circular route covers 93 miles, starting and finishing at Ullapool. Four suggested excursions add: Reiff, 1.5 miles each way; Achmelvich, 1.5 miles each way; Stoer Peninsula, 4 miles each way; and Kylesku, 2 miles each way. Fuel: There are petrol stations open at least some of the time at Ullapool and Lochinver.